We live in my grandparents home. The home and farmstead that they rented when they were a young couple first starting out as farmers. When my grandfather died in 2000, my grandmother wanted a housecat to fill the void. She brought in a barn cat and named her Amber for her orange/red coloring. But Amber had different plans, and ended up wanting to be outside where she felt more comfortable. My cousin, Krystal, went with our grandma to the local humane society and picked out a housecat. His name was Jack, and was a former housecat. I happened to be home one weekend, and I was sent to go pick him up and bring him to his new home. My grandma changed his name to Ambrose because he reminded her of Amber. Jack lived a happy life with my grandma until my grandma passed away in 2008. Jack slept with her, kept her lap warm, and was wonderful company. He had a tendency to show affection by biting and clawing, but he loved my grandma and she loved him. After she died, the house was empty. My dad was coming to the farm to do sheep chores everyday and so he took care of Jack’s litter boxes for a few weeks. Later he put Jack in the garage, and Jack lived there for a few months. Then my dad didn’t want to do any litter box cleaning anymore, so he put Jack outside in the fall of 2008 to “sink or swim”. When we moved to this farmstead in 2010, Jack was “swimming”! He survived a few winters outside and seemed to enjoy it. He became the King of the barn. All the barn cats respected him. We brought him to the vet every year to get his annual check up and shots. And a few years ago, we brought in a friend for him named Jumpin’ Jack. A neighbor, who happened to be one of my grandmother’s former schoolhouse students (even though they were only 10 years apart in age) and long time West Saint Charles township community member, moved into town and needed a place for her 3 outdoor cats. They came to us fixed and ready to live on our farm. The two girls ran away, but Jumpin’ Jack stayed. We renamed him Jungle Jim since we already had a Jack. They quickly became good friends. They slept together, played together, they fought sometimes, but were very much like brothers. In the last few weeks, Jack had been wanting to come into the house. He would sneak into the garage and curl up and lay on a stack of gloves on a shelf by the backdoor. We didn’t really understand then why he was doing that suddenly. But we humored him and let him be where he wanted to be. Yesterday (Saturday) while we were on our way to town, we saw Jack acting strangely. He had been starting to show his age, what we think was a ripe old age of almost 18 years old. So we knew a time would come to need to put him down. But after a recent vet checkup, the vet said he was healthy and fine. 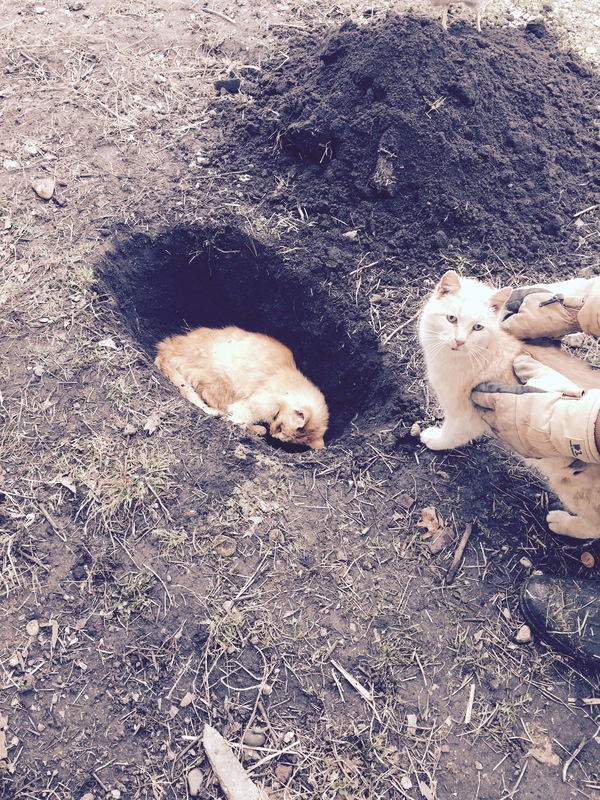 When we returned from town later that afternoon we saw him curled up in a chicken dust bath hole up against the house. He was sleeping. We woke him, brought him inside, laid him on a cushiony pet bed, where he curled up. We had planned on Monday, to call the vet. Shortly after we put him on the cushion in the house, he passed away. He was telling us all along, he wanted to be where he felt most comfortable to die. Animals do speak. And they give us all the signs in their own language. We as humans, just need to listen. I have much respect for Jack. He lived through adversity. He dealt with the cards handed to him. He was a survivor. He is one the last remaining animals on this farm that was here when my grandmother was still alive (there is one other barn cat). His life and death are reminders to us of the past and the era that once was on this farm. He reminds me of my grandmother, my grandmother’s final friend and housemate (tears flowing here). We decided to bury Jack where he liked to lay. Close to the house. Today on Easter Sunday. We are giving his body back to the earth. Rest in peace Jack. We hope you are sitting on grandma’s lap now, where you were always the happiest. Here he lays to rest with his friend, Jungle Jim, saying goodbye.